Pai is situated within a mountain valley surrounded by picturesque hills. The streets are filled with endless cafes as well as bars with live music (and very talented musicians). 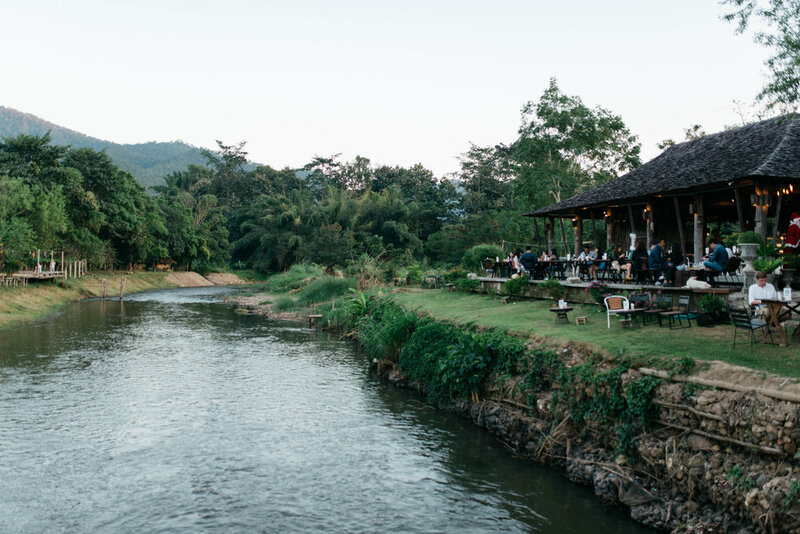 Within a few minutes of wandering around Pai, you'll quickly catch onto the mellow, hippie vibes of the town. Our time in Pai was without a doubt the most low-key week we've had abroad. DO a whole lot of nothing and relax! Make the long trek to Mae Yen Waterfalls. The hike through the forest takes two to three hours. It isn't very steep until the end, and is surrounded by truly untouched nature. You'll want to wear comfortable sandals as you'll cross through multiple rivers along the way. We were lucky enough to go with backpackers who have been in Pai for many years now and knew their way around. We suggest looking into the directions and getting a good bearing of the land before going. Spend a day lounging poolside at Fluid. It'll cost you less than $2 USD for some chill music, lounge chairs, and an awesome pool. You can walk there from town or take a quick scooter ride. Wander along Pai River (located a few minutes from Walking Street). Here you'll be able to enjoy coffee or a meal with a view, relax on swings, have some beer during sunset, or just take in all the scenery during a short walk. EAT breakfast or lunch at Om Garden Cafe. The meals are huge and delicious, and the restaurant setting is beautiful/peaceful. Om Garden is known for their carrot cake, so grab a slice with coffee and enjoy your slowpaced morning! We also loved Big's Little Cafe! Here you'll find fresh breakfasts made by the most kind chef (Big). He chatted with us all morning while making our delicious food. Try authentic Thai food at Pen's Kitchen. We recommend the stir fry panang curry. There are also lots of street food options on Walking Street. The options here are endless! Especially during the evening Walking Street Market. You'll find 7-Elevens everywhere (within Thailand in general). They sell "toasties" that are definitely worth eating - especially if you've had a late night drinking. Specifically try the duo chicken pizza, ham and cheese, or carbonara danish. We also loved the Green Tea Kit-Kats. DRINK with a group of new friends anywhere in town! The unofficial Pai pub crawl seems to consist of starting at Boom Bar, heading to Yellow Sun, and ending the late night at Don't Cry. If you want a more low key night enjoying Pai's talented local music scene, check out Edible Jazz or Why Not Bar. STAY at Common Grounds Pai if you are looking for a friendly, relaxing yet lively hostel. We met some of the most incredible people here and definitely did not want to leave. The common area is full of hammocks, and there's also a great bar, sweet hostel dogs, and lots of new friends. The location is right off Walking Street, and close to everything you'll need in Pai. For a more quaint and romantic experience, stay right along the river at Baan Pai Riverside. 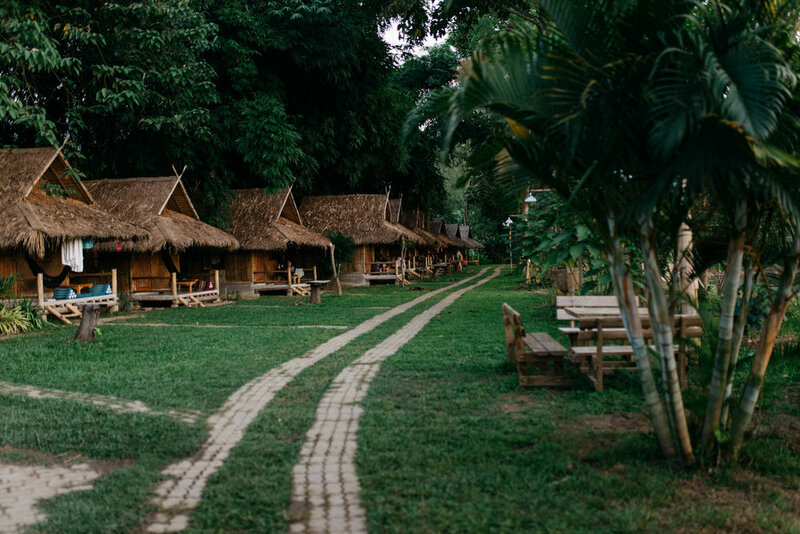 We didn't personally stay here, but we walked by the huts often and were told they are a cute/peaceful way to stay in Pai. KNOW the bus ride between Chiang Mai and Pai is three hours on a winding road. It's bound to make you feel a bit quezy. If you have time, rent a scooter and do the drive yourself. The rental company will transport your bags to Pai for you.